My soon-to-be sister in law asked for this 70s classic for her birthday and I was all too happy to oblige. I had never baked it before, which is always exciting, and I couldn't wait to put a modern spin on this retro dessert. After scouring black forest gateau recipes and getting the general gist I put my own version together, it went down a treat! Preheat the oven to 190C/170C fan/gas 5. Grease and line 3 x 20cm sandwich tins with. I only own 2 tins so I put 2 cakes in, and reused one of the tins for the third! Put all of the cake ingredients in a bowl and mix on a high setting until you have a smooth thick mixture. Divide the mixture between the tins and smooth the top with a palette knife. Bake for 20-25 minutes or until the cakes are springy to touch and coming away from the sides of the tin. Cool in the tin for 10 minutes then turn out onto a wire rack leaving to cool completely. Put the jam and the cherries into a saucepan and place on a low heat until gently simmering. Cook for 6-8 minutes, occasionally stirring, until the jam has melted and the cherries are starting to swell. Leave to cool and set for 15 minutes. Once set, spread the cherry jam mixture onto two of the cakes, leave to cool completely. Meanwhile whip the cream until soft peaks start to form. 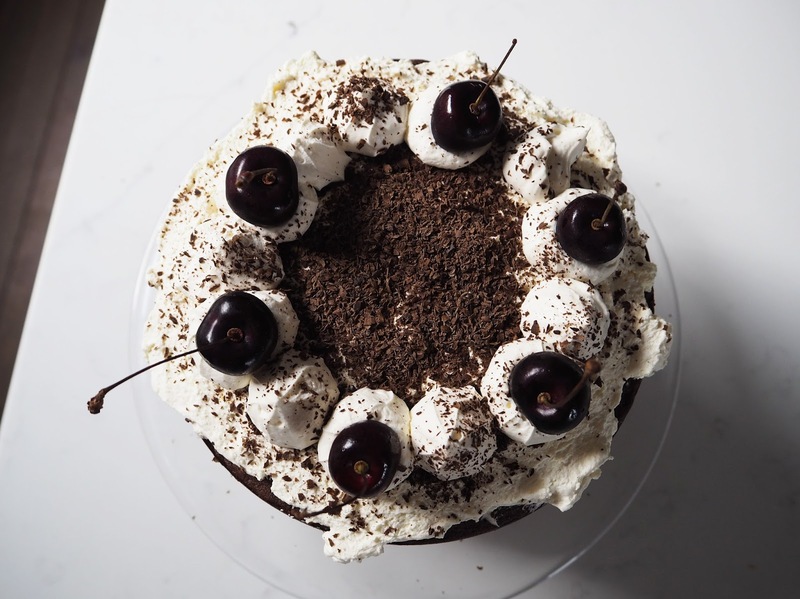 Transfer one of the cakes with the cherry mixture on to a cake stand, dollop about three large spoonfuls of the whipped cream onto the cake, gently spreading. 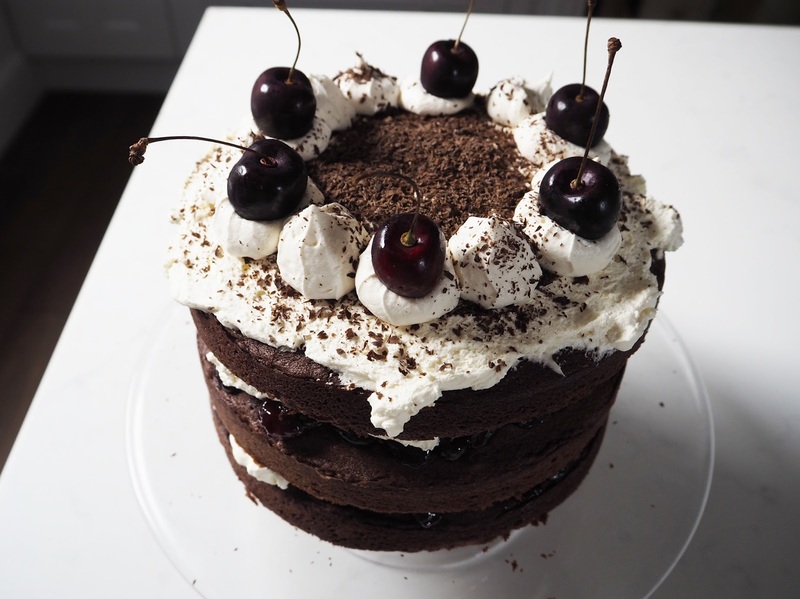 Repeat with the second cherry mixture cake. Then place the last cake on top. Spread the remaining whip cream onto the top layer, leaving a little behind for piping. Sprinkle the top with grated chocolate. Pip rosettes around the edge of the cake, again sprinkle with the chocolate. Tip the remaining chocolate into the centre of the cake. Alternately pop a cherry onto the rosette cream swirls. Some would say the only way to enjoy this cake is to pop on your flares, some platforms and a bit of Iggy Pop!